Hankering to flashback to a more innocent, simpler time? The Fifties is a decade that has romanticized the teenage culture with bopping at the sock-hop school dance, meeting friends down at the malt shop and cruising the streets in big-finned convertible. Poodle skirts, bobby socks and saddle shoes were all the rage for the girls while boys kept it clean in khakis and a button-down shirt. Of course, some of the kids were edgier wearing rolled-up jeans and black leather (or pink satin!) jackets like the teenage gangs from the show “ Grease”. 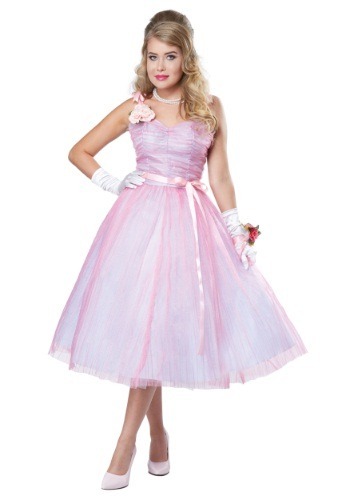 You’ll be set to twist the night away in a 50s costume such as a pink poodle skirtwith matching chiffon scarf tied around your neck. Guys can dress up as part of the band in a bright plaid tuxedo style jacket and a slicked back pompadour wig. Of course, the Fiftiesweren’t just about the kids: Moms and Dads lived in up as well, playing bridge with the neighbors of having the boss over for cocktails. If you’re looking for a 50s costume of a mature ilk, think June and Ward Cleaver from “Leave it to Beaver”. 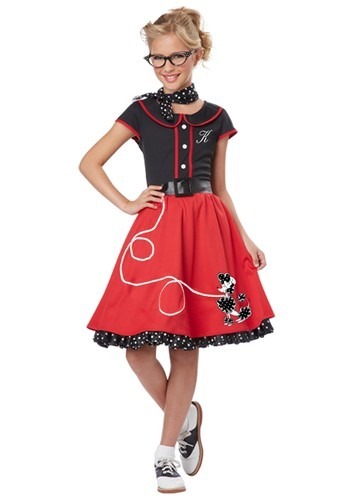 Don’t forget the bouffant hair-do, shirtwaist dress and cat-eye glasses!